Seattle has always been on the cutting edge of culinary and drink trends – and we sure love to celebrate it! There’s almost always a festival or event going on. Take for example the Seattle Food and Wine Experience, which will be this Sunday (February 24th) at the Seattle Center Exhibition Hall from 12pm – 5pm – it’s definitely one of my faves! Held annually, this year’s event is going to be as exciting as ever. Its jam packed with tons of chefs, demos, expert speakers, and lots of wine to taste (featuring cellars from Washington, Oregon, California, Idaho and more!). Don’t forget to make room for all the available gourmet bites as well as Pacific Northwest distilled spirits, coffees, and brews, too. Yum! Tons of exhibitors will be selling their wares, so keep your eyes out for any gifts you may need to buy, or even take something home for yourself! Make sure to buy your tickets soon. The beginning of 2013 marked the start of Vinum Importing’s monthly cocktail competitions and for March, the theme is anise. Native to the Mediterranean and Southwest Asia, anise-flavored spirits have already made appearances in plenty of cocktails, but Vinum’s competition challenges bartenders to put anise in the spotlight. If you’re a fan of anise then this is the event for you! The competition will take place at Vessel on March 4th at 6:30pm. The guest judges include Imbibe Magazine’s Jen Boelts, 5th generation distiller Matteo Meletti, and Cocktail Chronicles’ Paul Clarke. For more information on the Vinum Cocktail Competitions and the schedule, check out the competition website. I heard Amy speak this last summer at Tales of the Cocktail – it was one of my favorite seminars of all times. Not only was the content interesting but Amy is a fun and engaging speaker. If you love booze and you love geeky stuff – you will love her book! From oak trees to lemon verbena, Amy gives a detailed and intriguing account of the various herbal ingredients we use in cocktails and liqueurs. With over 50 recipes, chemistry of over 150 plants, and growing tips for gardeners, this is the perfect gift for those with a green thumb and love to imbibe. Amy is an award winning author of 6 books detailing the delights and dangers of Mother Nature. Living in sunny California, her backyard is one big herbal experiment, and the bookstore she and her husband own is a veritable maze of fascinating finds. 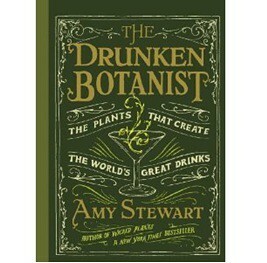 The Drunken Botanist: “The plants that create the world’s great drinks”, by Amy Stewart is coming this March. Available for pre-order now at drunkenbotanist.com and on Amazon. Make sure you check out her funny promotion video! Looking to create some chocolatey goodness for your sweety? Check out the Pool & Spa Outdoor blog featuring the 10 Chocolate Dessert Recipes for Valentine’s Day – including my recipe for Chocolate Covered Cherry Jumbles! Yogurt is one of my definite go-to, easy snacks. It’s healthy; individually packaged; and come in a wide variety of flavors! From Boston Cream Pie to Passion Fruit, to Orange Creamsicle to Boysenberry. And these days, people just can get enough of Greek Yogurt! It’s creamy and smooth and the low-fat varieties taste so luscious! Greek yogurt is packed with muscle-building and appetite suppressing proteins, and fat-free versions are low in calories and sugar, making this treat a total win-win in my books. For added flavor, top it with freshly chopped fruits, crunchy granola, a drizzle of honey, or… shaved dark chocolate! The options are endless! This dairy darling has many d’lish applications. I love mixing it into mashed potatoes or adding a dollop on top of my morning oatmeal drizzled with maple syrup. For healthy app, dip rice crackers or baked chips into plain Greek yogurt topped with salsa and a sprinkling of chopped cilantro – delicioso! Greek yogurt is the perfect addition to any morning routine. It’s great when blended into my Fiber Packed Breakfast Smoothie! Blended with a whole-peeled orange, a spoonful of local honey, ice and a few flax seeds–you’ll have the energy you need to start your day right. The great thing about smoothies are that you can customize to your personal taste. Add a tablespoon of protein powder, or toss in some fresh or frozen berries. Using a whole orange adds not only great taste, but extra fiber too. And if you want to jack up the fiber even more add a few torn leaves of fresh kale. And if you really love smoothies- be sure to get yourself a fantastic blender. I love my Vitamix it makes smoothies in a flash! Cut the peel off the oranges, trim away any white pith, cut the fruit into chunks, removing any seeds. Place the orange, banana, yogurt, honey, flax seeds and ice in a blender cup and blend on high speed until smooth. Divide between two glasses and serve immediately . Speed Rack Comes to Seattle! Speed Rack comes to Seattle! So mark your calendars for Sunday, February 10th from 3:00pm – 7:00pm at Century Ballroom and make sure to buy your tickets soon! Founded by Lynnette Marrero and Ivy Mix, this national cocktail competition/fundraiser features top regional female bartenders in a head-to-head round robin style timed and judged challenge. 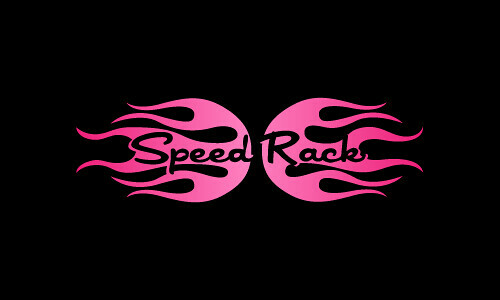 Winner of the upcoming Seattle event will then get the opportunity to compete in the finals and where the winner will be crowned Miss Speed Rack USA! All the proceeds raised will go to breast cancer research, prevention and education. I’m looking forward to judging the Seattle event and seeing all our top Washington shakers shine! Make sure to buy your tickets in advanced and visit www.speed-rack.com for more info. “Get Crackin’” has become a familiar tagline in TV commercials for the wonderful pistachio – but this little nut is more than just a pop culture phenomenon. Listed as a super food, nuts, and pistachios in particular, have a wide range of health benefits to top off their delicious flavor. From heart-healthy fats to high protein content, pistachios are the perfect snack or as a lovely accent to many d’lish dishes! Sprinkle pistachios over Greek yogurt with dried cherries for a nutritious treat. Mix them in with dark chocolate, mini pretzels and dried cranberries for an indulgent trail mix. Or use them to finish off my Roasted Beets with Orange Honey Vinaigrette and Pistachios for tasty texture. One of my favorite recipes featuring pistachios is my Warm Orange & Pistachio Bittersweet Chocolate Cake. Baked right in little mason jars and topped with a pouf of orange cream, these mini cakes are so cute and perfect for weekend entertaining! You can prepare this recipe part way in advance: After roasting beets, cover and refrigerate for up to 3 days. When ready to serve, drain beets again if necessary, and proceed with the recipe, sauteing beets in the syrupy vinaigrette until heated through. Peel beets and cut into 1-inch chunks. Toss beets with 1 tablespoon of the olive oil and place in a 9- x 13-inch baking pan, then cover pan with foil. Roast beets in preheated oven about 40 minutes, then remove foil and continue roasting about 15 – 20 minutes more until beets are tender. Remove beets from oven and drain off any excess liquid. Meanwhile, in a saute pan, whisk together remaining olive oil, OJ concentrate, lemon juice, honey, salt and pepper, and place over medium-high heat. Cook for about 1 1/2 minutes, or until syrupy. Add beets and saute to coat evenly. Sprinkle nuts on top to garnish. Serve hot or at room temperature. 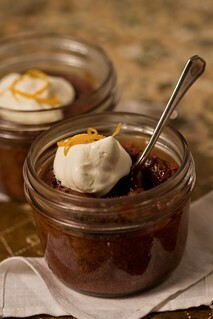 You can also make the cake batter up the day before, then just assemble in the jars, bake and serve warm! If baking ahead, you can chill down the baked cakes and just give a quick reheat in a hot oven or microwave to warm them. To make the cake batter: In a double boiler or medium bowl set over a pan of simmering water, combine the chocolate and butter. Heat over medium heat, stirring often, until the butter and chocolate are just barely melted. Remove from the heat and stir until completely melted. In another bowl, beat together the eggs, sugar, vanilla, zest, flour, orange juice concentrate and liqueur. Stir in the melted chocolate mixture and the pistachios. Refrigerate batter for 2 hours or up to overnight. To bake the cakes: Preheat oven to 375 degrees F.
Stir the batter to distribute the nuts. Divide the batter evenly, scooping 1/2 cup batter into each of 6 half-pint, wide-mouth canning jars (or you can substitute glass custard cups). Place the jars on a baking sheet and bake for about 22 to 28 minutes, or until the cakes are set but the centers are still very, very soft. (See chef’s note.) Let cool for 3 to 4 minutes and serve warm. To make the orange cream: While the cakes are cooking, whisk the cream and powdered sugar together in a medium bowl until lightly peaking. Add the sour cream and orange juice concentrate. Whisk in until nicely peaking. Top each cake with a dollop of cream and sprinkle with orange zest. Chef’s note: Ovens differ, so bake the cakes for about 22 minutes for very soft center or 24 to 28 minutes for somewhat firmer centers. When removed from the oven, the centers of the cakes should still be gooey. If using cold batter from the refrigerator the cakes will take longer to cook.